The No. 7-seed Nevada Wolf Pack take on the 10-seed Florida Gators in the first round of the 2019 NCAA Tournament on Thursday at 6:50 p.m. ET. The Wolf Pack are 2.5-point favorites, with the over-under set at 133.5 in the latest Florida vs. Nevada odds. Last year, Nevada made a Sweet 16 run as the 7-seed in the South, and this year it will look to duplicate that performance in the West after a 29-4 season in which it split the Mountain West regular-season title with Utah State. Meanwhile, Florida enters 2019 March Madness off an SEC Tournament semifinal run that included wins over Arkansas and LSU. Thursday's matchup is a contrast of styles, which is why both sides have been favored at some point this week. So before you make your Florida vs. Nevada picks, be sure to check out the 2019 NCAA Tournament predictions from the SportsLine Projection Model. This model, which simulates every game 10,000 times, has raked in the winnings for those following its picks. Over the past two years, the SportsLine Projection Model has returned over $4,000 to $100 players on its top-rated college basketball picks. It also entered the postseason on a strong 11-5 run on all top-rated plays. Anyone who has followed it is way up. Now, the model has simulated Florida vs. Nevada 10,000. We can tell you it is leaning over, but it also has a strong against-the-spread pick that hits in well over 50 percent of simulations. That pick is available only at SportsLine. Entering this 7 vs. 10 showdown, the model knows Florida try to get the Wolf Pack out of sync with ball pressure. The Gators boast the No. 18 scoring defense because they are very feisty on the perimeter, plus they rotate quickly and help one another. That's why they ranked No. 11 in the nation in opponents' assist-to-turnover ratio. Florida forced turnovers on 19.4 percent of its opponents' possessions. That's the 19th-best rate in the nation. Against a Nevada offense that relies on rhythm to score more than 80 points per game, Florida would seem ideally suited to be disruptive. But just because they bring a ferocious defense doesn't mean the Gators will cover the Florida vs. Nevada spread in the first round of the 2019 NCAA Tournament. Nevada brought back the key trio of Caleb Martin, Cody Martin and Jordan Caroline from last year's Sweet 16 run, which means the Wolf Pack have plenty of experience and scoring ability. The three 6-foot-7 forwards don't operate like your typical frontcourt either. Caleb Martin takes the primary scoring role (19.2 ppg), Cody Martin serves as a point forward (11.7 ppg and 5.1 apg) and Caroline plays the more traditional post role (17.3 ppg and 9.6 rpg) while occasionally stretching the floor. Against a younger, guard-oriented Florida roster, the big three could be too much to handle. So who wins Nevada vs. Florida? And which side of the spread hits in well over 50 percent of simulations? 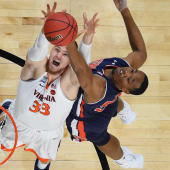 Visit SportsLine now to find out which side of the Nevada vs. Florida spread you need to jump on, all from the model that has crushed college hoops, and find out.